Jeff Nelson left his final plate game of the 2017 regular season due to an issue with the umpire's right eye. 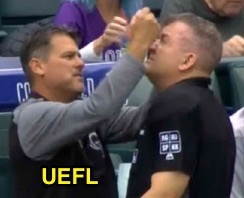 Rockies trainer examines Nelson's eye. In the bottom of the 1st inning of Sunday's Dodgers-Rockies game, Nelson met with Colorado's training staff regarding an undisclosed issue with his right eye. He remained in the game at the time, but ultimately left the contest prior to the top of the 3rd inning. The substitution ran so smoothly, neither broadcast mentioned the umpire switch to begin the inning. 2B Umpire Ryan Blakney replaced Nelson behind home plate, while 1B Umpire Cory Blaser and 3B Umpire Doug Eddings split the field umpires' duties. Eddings additionally assumed the role of acting crew chief for the game's remainder. Relevant Injury History: Nelson left a May 23, 2016 game between the Rockies and Pirates after dirt kicked up by a sliding runner became embedded in his eyes.